Circle Mar. 20 on your must-own DVD and/or Blu-ray release calendar. Just do it, especially if you are a film noir buff!!! 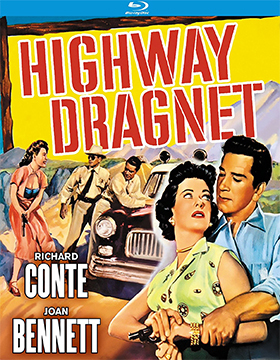 Finally, finally, finally director Nathan Juran’s 1954 film noir gem, Highway Dragnet (film icon Roger Corman’s first film production credit) will be given a legitimate home entertainment release … not just as a DVD, but as both DVD and Blu-ray product offerings from Kino Lorber on Mar. 20. Korean War vet, Sgt. Jim Henry (played by Richard Conte, who became a star with his performance as the wise-talking Private Rivera in director Lewis Milestone’s 1945 World War II masterpiece, A Walk in the Sun … plus such film credits as Thieves' Highway, Whirlpool, The Godfather, The Big Combo, etc.) gets into an argument with a blonde floozy (Mary Beth Hughes) at a Las Vegas bar. The next day she is found dead and Jim is the prime suspect. He manages to escape the police when they are trying to arrest him and gets away in one of their own police cruisers, which he quickly ditches in the desert. While making his escape, he notices two women with car trouble and doubles back to hitch a ride with them … it is the perfect cover!! 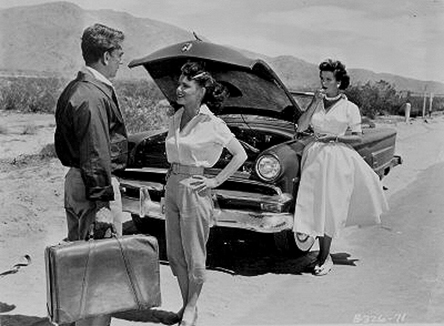 The women he cons into getting a ride with are Mrs. Cummings (Joan Bennett), one of the country’s top photographers for various publications and her latest model, Susan (Wanda Hendrix — Ride the Pink Horse, Captain Carey, U.S.A., etc. ), but instead of just getting beyond the police dragnet and moving on from there, he accepts Mrs. Cummings’ invitation to stay with them at the Apple Valley Inn. From this point on it becomes a cat-and-mouse game involving Jim, the police (led by Reed Hadley), who remain in hot pursuit and the real killer. This Allied Artist theatrical release (in early 1954) is probably the most underrated film noir from the period … it’s about time that it will be available for film buffs, collectors and film noir aficionados to add to their film libraries.